Why Rikhi Ram instruments are special? The musical instruments built at Rikhi Ram Originals, are carefully crafted from raw timber into a master piece, wafting out beautiful & rich sound and tone. There are many factors involved in building a fine quality musical instrument, starting from seasoning of wood. The best way of seasoning the wood is the natural process by leaving the wood for seasoning for 3 to 4 years for semi-professional models and average 10 yrs for professional models. After seasoning the wood the most important aspect we keep in mind is to put in our 3 generations of expertise of workmanship in crafting out the best musical instrument whether the strings, wind or percussion instrument. Among the string instruments the sitar is the most complex & popular instrument. We were the first ones to categorize & standardize the sitar models according to the specifications decided along with the great maestros. Earlier Pt. 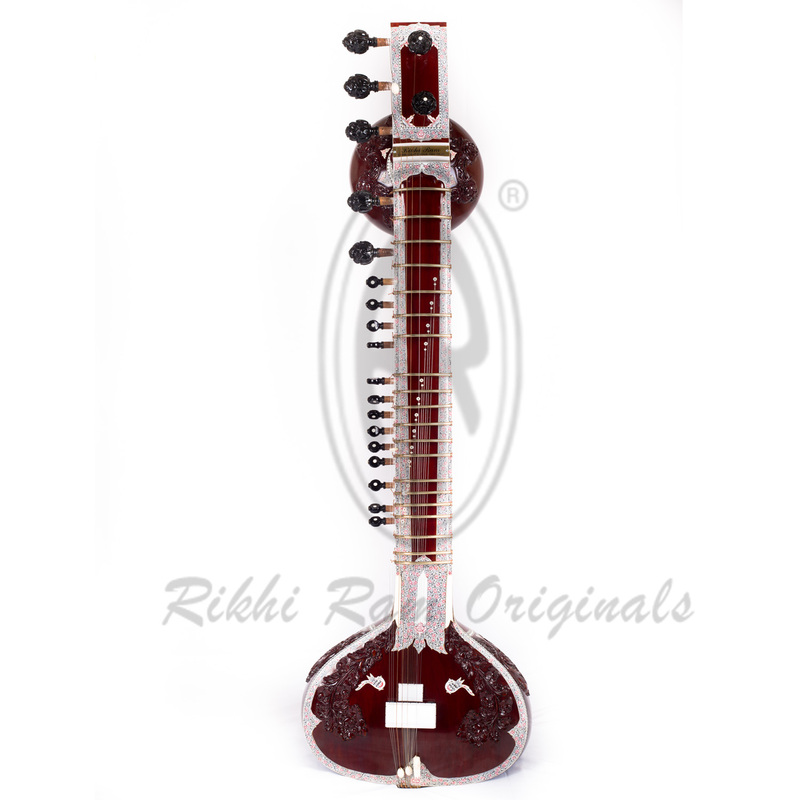 Ravi Shankar style sitar and Ustad Vilayat Khan style sitars were the two styles made by us. Now recently we have standardised & started making Pt.Nikhil Banerjee and Ustad Shahid Parvez style sitars also. The body structure of sitar & other string instruments are made according to a carefully designed measurement as per different style. The measurements are very important & the guage of the wood go hand in hand to produce a good tonal sound instrument. While constructing the instrument it is very important to fix the joints perfectly for attaining a stable tuning. The polish used by us is the best quality French Shellac in spirit base which helps in giving a warm and rich sound. We do not use the Varnish or Polyurethane material which gives a high gloss finish but completely kills the sound. The Bridge, Frets, Nut & Pegs fitting of sitar & string instruments is very carefully done to provide the player a very smooth playing of meend, tans & jhala. Our sitars have the capacity to give the players a five note meend from one fret, without disturbing the tuning. The strings used by us are made as per our specifications by string manufacturers in USA. We use steel strings of high tensile strength & high carbon steel which are tin & silver plated. The phosphorous strings are also of high tensile strength. The bridges used earlier by musicians were made from camel Bone or Deer horn. But we have designed the new synthetic bridges which not only give the same warm & balanced sound as the bone bridges but also do not cut easily & are more long lasting. The curvature of the bridge, which is a deciding factor in giving a beautiful sounding instrument, is our family lineage secret. The filing of the bridge is done according to the particular style being played by the musician. It is all the above expertise in workmanship & structure that contributes to make a balanced instrument which gives a warm, bright and rich tone. © Copyright 2018. www.rikhiram.com, All rights reserved.